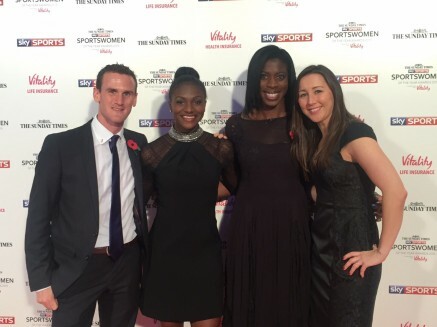 6th November 2015 – Dina Asher-Smith (GBR) has been named the Sunday Times and Sky Sports Young Sportswoman of the Year for 2015 at a glamorous awards ceremony in London. It was a case of third time lucky for Dina who has also been nominated for the award for the past two years but with 2015 seeing her break the British 200m record when finishing fifth at the IAAF World Championships in Beijing, and also become the first British woman to break 11 seconds for the 100m there was to be no stopping her this time around. 2013 Sportswoman of the Year Christine Ohuruogu (GBR) presented this years main award to Jessica Ennis-Hill.